What is Tongue and Groove Flooring? When you buy flooring for your home it can come in a variety of styles. Some flooring options come in planks and some can come in sheets. It really just depends on the kind of flooring you are looking for. Tongue and groove flooring has a tongue side that sticks out and a receiving groove side that is indented. Each floor board can slide into place because the tongue side can slide into the groove side. This allows a simple vertical movement to slide your floor boards together and into place during installation. 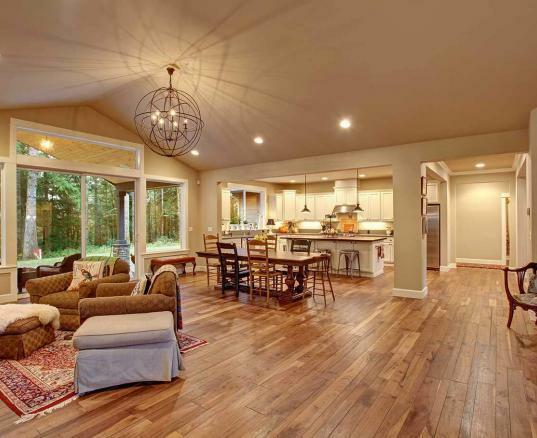 There are many advantages of tongue and groove flooring installation. When you use the sliding boards together method there is less of a chance you’ll need to spend money on other installation materials like adhesive or a nail gun. You’ll also save time because you don’t have to staple each board together during installation. Another great advantage that homeowners love is that tongue and groove flooring is usually pretty airtight which means you won’t have to worry about moisture getting in. This is especially helpful when you’re choosing flooring for a high moisture room like the bathroom or the kitchen. Although most homeowners say tongue and groove flooring installation is relatively stress free there are a few exceptions. Sometimes it can be difficult to slide the tongue and groove together. If you are having issues getting them to slide together, then we’d suggest using a soft face mallet to gently tap the boards. This will help them slide together a little easier. Another minor issue is that taking the floorboards apart can be really hard. However, this won’t be an issue if you decide to keep the same flooring in your home for a long period of time. You can find tongue and groove flooring for a number of floor types. When you’re searching for flooring in your home just make sure you check to see what the installation type for the flooring is. You can always ask the manufacturer if they have anything similar to tongue and groove because often they will. Now that you know everything about tongue and groove flooring installation you can get started on your home improvement project. Browse ReallyCheapFloors.com’ prefinished hardwood flooring to find the best fit for your home. When is the Best Time to Install Hardwood Floors?